The collaboration between DANA Indonesia and Bukalapak continues. After receiving payment using DANA a while ago, both now collaborate to create Buka DANA. It’s an e-money platform as the new payment method in Bukalapak. Buka DANA is currently available on the Android version. Buka DANA feature is available since August 10, 2018. Aside from being a payment method at Bukalapak, it can also be used as an alternative to accommodate temporary assets from canceled transactions (refund). Buka DANA is a collaboration of two companies under EMTEK group. Previously, Bukalapak owns BukaDompet platform which operation was suspended by Bank Indonesia. Buka DANA feature in Bukalapak facilitates consumers to control their DANA account. The integration is one of Bukalapak’s innovation to boost transaction using e-money. In its early collaboration with Bukalapak, Vincent Iswaratioso, DANA’s CEO, said that Bukalapak’s customers will be guaranteed with safety, speed, easy, and efficient transaction. 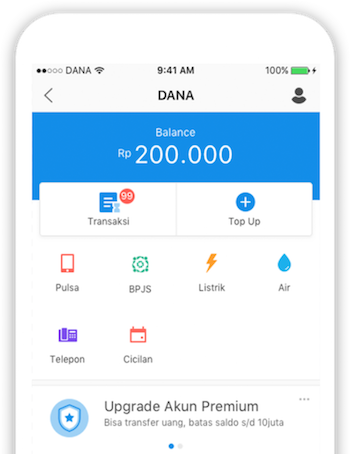 There’s no need to download any app because DANA has been integrated with the Bukalapak app. In terms of activation, users with Bukalapak’s account just have to complete the registration by adding an active phone number, enter BukaDompet menu, and choose Buka DANA activation. OTP will be sent to be entered by users to complete the activation.